Everyone was so friendly and helpful. When asking about places to eat or where to find rubber boots. Am planning another trip back to this house in the next few weeks. We are very impressed with the company and its staff. We found the information provided on the website to be very thorough and found the communication to be above and beyond our expectations. Every staff member we spoke to was very welcoming and helpful. We have no hesitation in using the services of this company again! 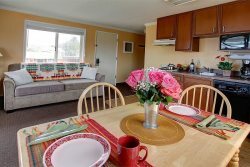 My second time staying with Cannon Beach Vacation Rentals, and I was not disappointed! So friendly, so helpful, so relaxing. Very good support, nice people. Reservation process could be made into a simpler on line process. Printing, scanning, and minor form details that go back and forth make the process of renting much more time consuming than other on line reservation systems.